How about celebrating this day by making some healthy and delicious that are naturally tri colored. Yes,you heard me right..not a drop of artificial colors. I am not a person who is fond of food colors especially when it comes to feeding kids. But then am not strongly against food colors but some how don't feel like using at home unless its an icing cake or where it becomes strongly inevitable. So,this year am celebrating independence day with tricolor idlis that are healthy and delicious. 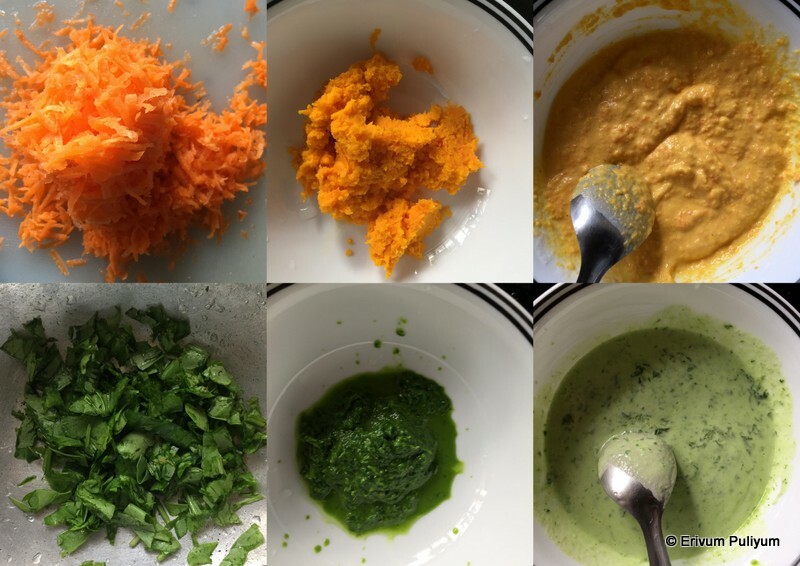 The saffron color was added with carrots which tasted sweet and the green color is given by spinach and they have no obvious taste or flavor of its own. I made these for my kids lunchboxes and they were very much happy to carry the idlis just to flaunt about the tricolor idlis. These idlis not only add the natural colors but also helps to sneak in veggies for kids who don't love greens esp spinach. 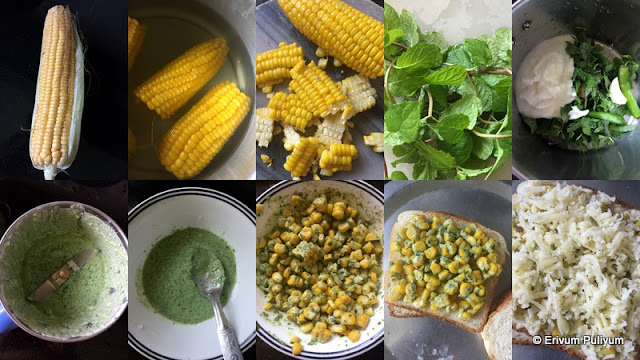 You can use mint coriander leaves instead of spinach too. But am doubtful of the flavor with coriander leaves(cilantro) as I have not taste checked them. 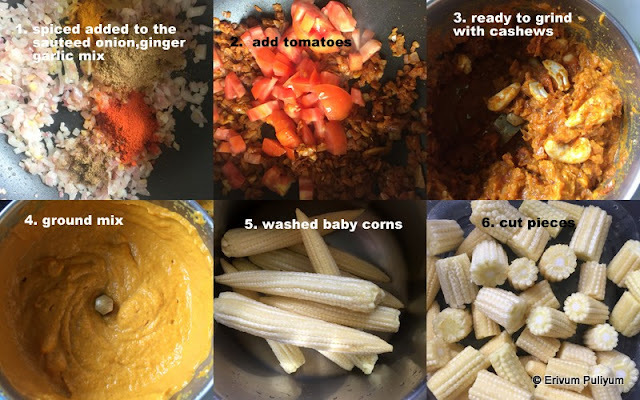 This can be made not only to mark our patriotism but also as a healthy alternative for kids lunchboxes if you are tired of the same old idlis. Enjoy!! I usually prepare the idli batter as in the following link. You can use whichever batter suits you best to make idlis. Ferment accordingly and add salt to the batter once fermented. Before making idlis, peel and grate the carrots. In a pan, saute the carrot with a tsp of oil with salt and then grind without adding any water or very very little batter as this may alter the consistency of the idli batter. Wash and chop the spinach, wilt it slightly with oil and then grind to a smooth paste(spinach may not need addition of water). Now, mix 2 ladle full idli batter to each of the pastes and make a colorful batter and reserve the white idli batter as the third batter. 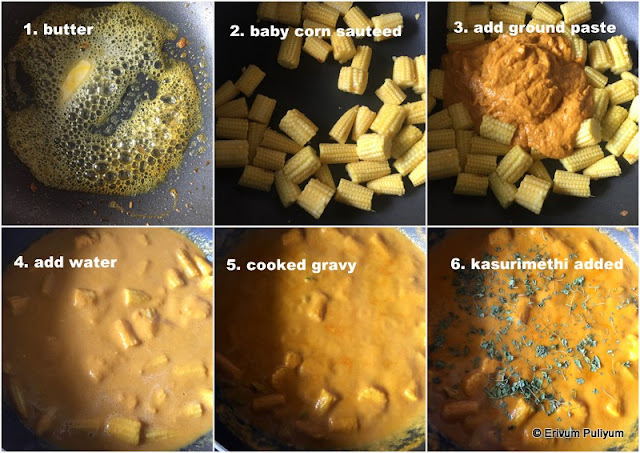 Grease your idli mould with oil if using steel ones and then pour half a tsp of batter in the mould starting with carrot then normal white idli batter and then spinach batter. 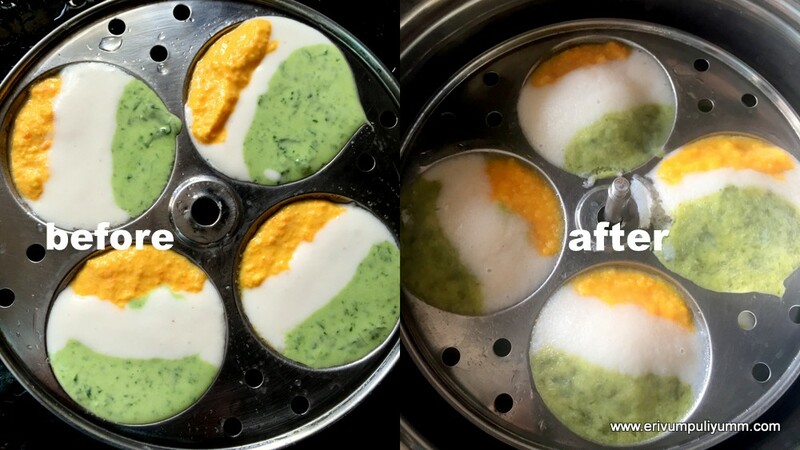 If you still have space then add the white idli batter again on top in such a way so that the orange and green color batter is not hidden and is evenly distributed. You may just add each color of batter in each mould and then steam cook too without mixing. But I personally feel adding all the three batter together imparts a nice colorful and flavorful idlis. Similarly fill in all moulds and then add enough water in the steamer and then steam cook for 12-15 minutes(it takes slightly longer than normal idlis to cook). Scoop out the idlis once slightly warm to touch with a spoon and serve immediately with tomato chutney / sambar / coconut chutney or any other chutneys of your choice. 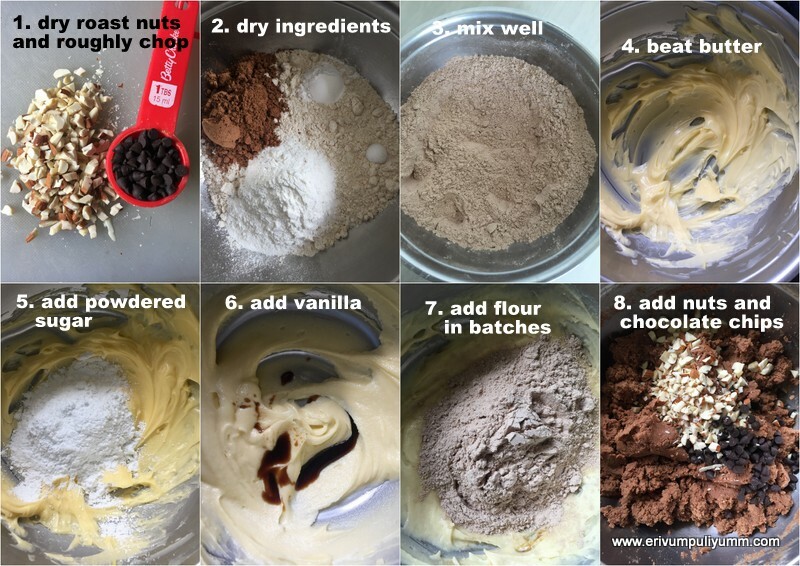 * You should adjust the consistency of the batter after mixing. If the batter is too thick then dilute with water or if its watery use minimal water to grind. * Add salt to the carrot and spinach lightly to flavor them. 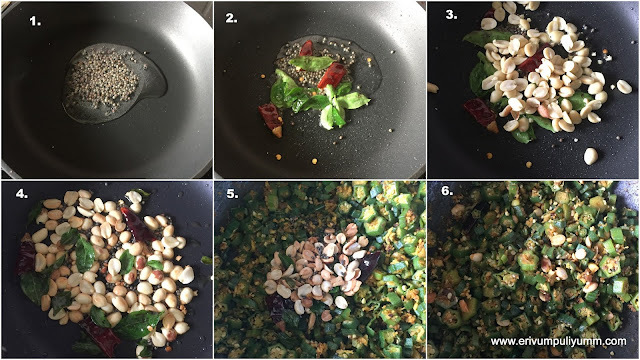 * You can even spice up the idlis lightly by adding chopped green chillies. * You may even add a round cut black olive in the center of the mould and then add the batters so that once cooked the idlis will have a proper flag look. 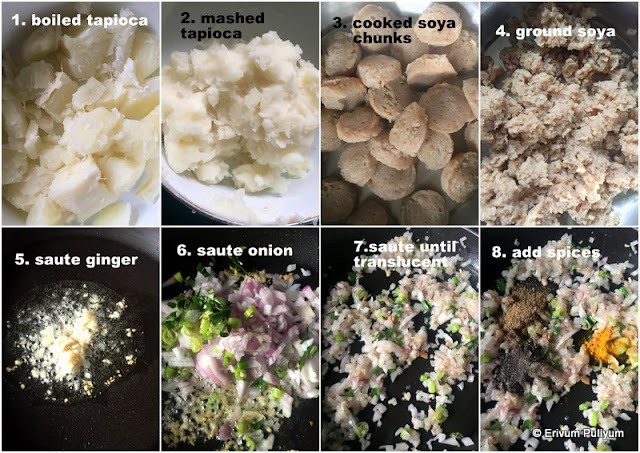 Tapioca is a versatile vegetable and can be used in many different recipes. My previous post of kappa (tapioca) vadas is a super duper hit at home and so these days am exploring the staple vegetable of Kerala though only few best ones see the lime light ;) Isn't it very good ? Tapioca is a fibrous vegetable but not very good for diabetics as it is full of starch. Coming back to today's recipe - Have you tried making cutlets with tapioca? Yes..you heard it right,tapioca acts as a binder just like potatoes. So, it is very good to incorporate this fibrous veggie and make cutlets.Cutlets are a family favorite here and so any type of cutlets is always welcome. Kappa can be added to any cutlets just like you add potatoes and enjoy making them at home. Try these out !! Boil the tapioca(kappa) as you normally do or go through this post to learn cleaning the tapioca and then boiling. Cook until very well cooked,drain water and keep aside to cool. When the tapioca pieces are easy to handle then remove the thick middle strand and any fibrous strands. Mash the tapioca(kappa) with a potato masher until smooth like mashed potatoes. In the mean time,boil the soya in enough water for 5 mins. Drain this water once its cooked and then rinse 3-4 times to remove the smell of soya chunks. Squeeze water completely each time after rinse. Now,add this to a blender jar and pulse twice to crush the soya chunks in a mince type soya. Heat oil in a pan and add the ginger garlic paste. Saute until the raw smell disappears and the paste looks slightly roasted. Add the finely chopped onion,green chillies and curry leaves. Add a pinch of salt and saute until slightly browned. Add in the spice powders on low flame and then add in the soya mince. Add salt as needed and keep sauteing till the water content is completely dried up and the masalas are finely coated. Add the mashed tapioca(kappa) and mix well to combine. Switch off flame and leave to cool. Beat an egg in a bowl well, keep aside. Spread the bread crumbs in a plate. Now,divide the mix in 12 divided balls. Flatten them slightly to the shape of cutlets. Dip these in egg mixture and roll in bread crumbs to coat well. Heat oil in a pan or wok and fry the cutlets once the oil is hot. Fry evenly all sides and don't over crowd the wok. Drain on a paper towel and serve warm with ketchup. 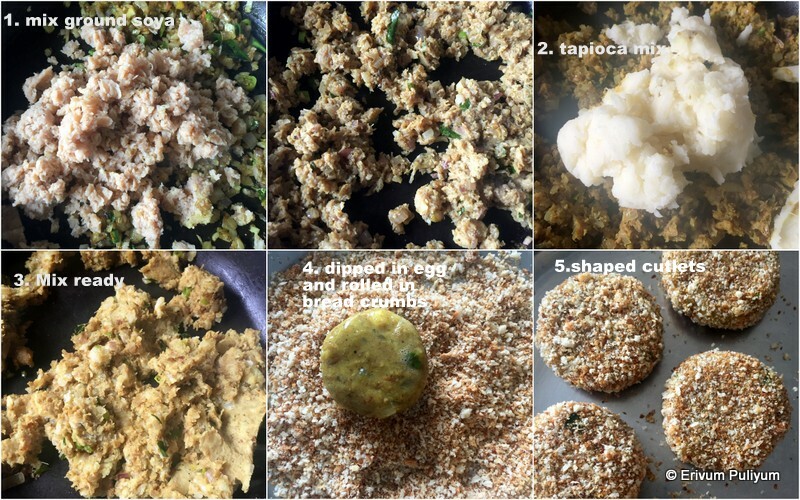 * You can use chicken or any other meat other than soya to make these cutlets. * If your cooked tapioca doesn't mash smooth then its better to add in a blender jar after removing the fibrous strands and pulse once or twice(without adding any water). * Remember to remove the cutlets from paper towel as soon as you feel they have soaked the excess oil else the cutlets turn soggy. Removing from paper towel and storing in dry plates will keep crispy. Onam is early this year towards August last week and most of the electronics,apparels and many things are on offers at this time of the year. This is one of the best festive time when all Keralites celebrate with zeal and enthusiasm. Today's post is a simple dish with vendakka /okra and mixed with yogurt and coconut sauce. This dish is popularly called pachadi in our place but towards the central part and northern part of Kerala this is khichadi and the sweet version is called pachadi. 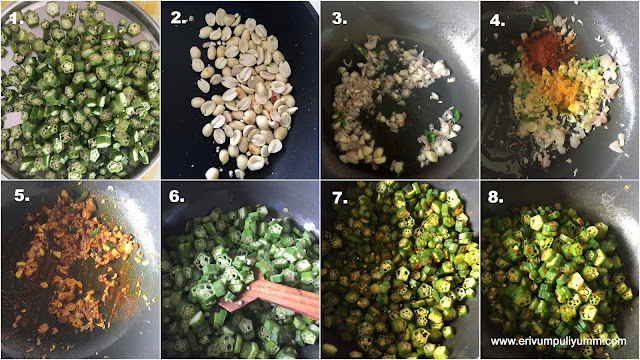 Anyways the name doesn't make the dish differ in taste and this is a quick yet simple sadya dish which can be prepared towards the end of sadya making within no time. We are not celebrating Onam this year as my FIL passed away early this year. 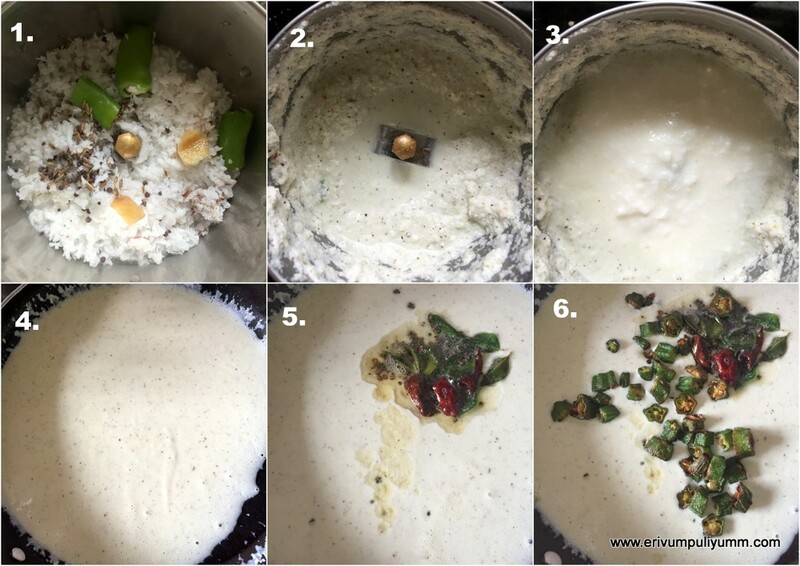 So no much fun to go on with Onam but I do prepare these sadya dishes not all together but one or the other in between.Unlike other pachadi or khichadi this has a delicious taste of the fried okra in the yogurt coconut sauce. 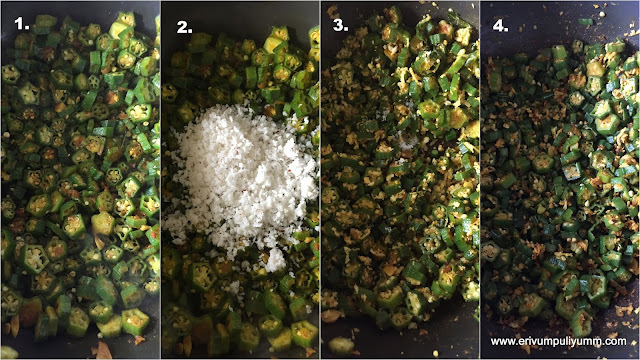 Add the fried okra/vendakka just before serving to get the yummy flavors. This is a very small serving of khichadi but if you wish to make larger quantities then double up the ingredients and try this out. I usually make it as a side dish and so make only very less amount. Do check this out !! Wash and pat dry the vendakka /okra. 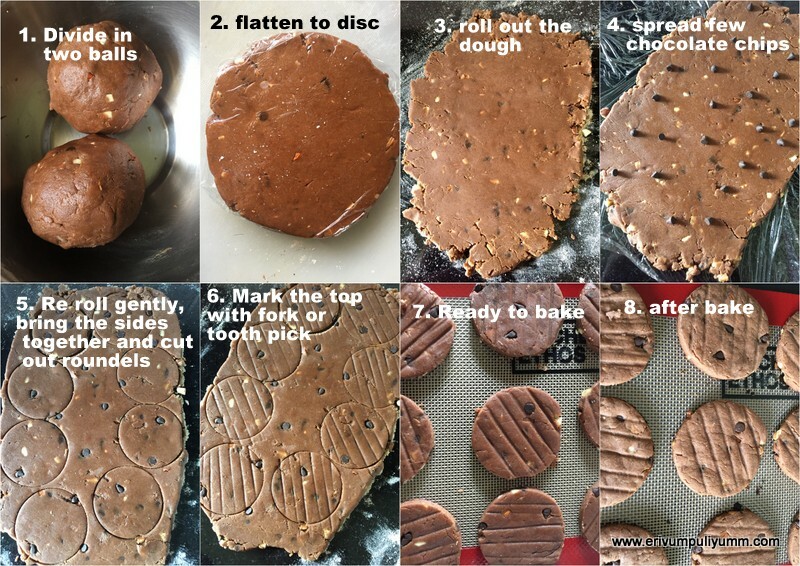 Cut in small pieces in rounds. Grind the ingredients under listed to grind to a smooth paste. Add the curd and beat well in a mixer. Heat oil in a pan and add the okra pieces. Add in a dash of salt. 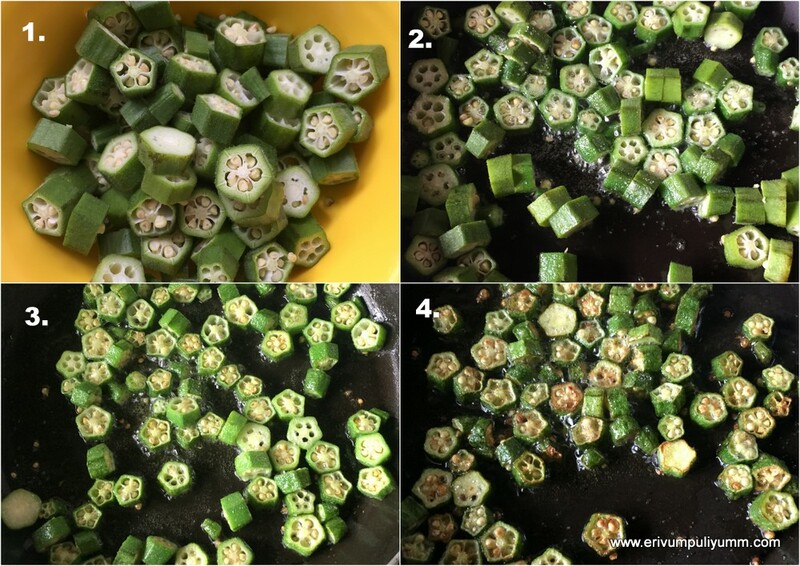 Fry till the okra turns crispy. Drain on a plate and if you have left over oil then temper the kichadi in the same pan,keep aside. In another pan, heat the coconut yogurt mixture on a low heat and turn off heat as soon as it is heated(don't wait for it to boil). Add salt as needed. Heat oil in the okra fried pan and splutter mustard seeds, dry red chillies and curry leaves. Pour this over the curd mixture. Add in the fried okra just before serving. Mix and serve warm. * Use a mildly sour curd or yogurt. Don't use very sour yogurt. * The kichadi thickens as it sits and can be prepared few hours in advance but make sure to mix the fried okra only just before serving.